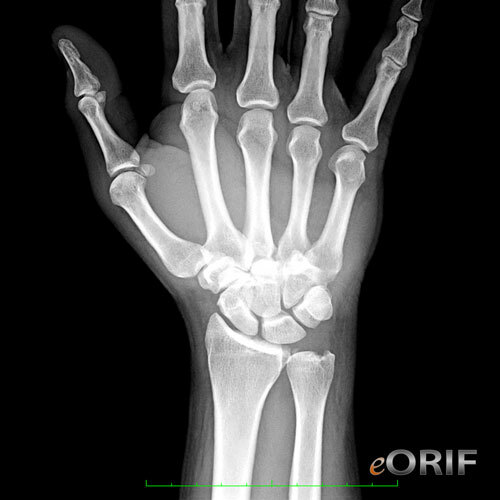 Isolated dorsal dislocations/fracture-dislocations occur from longitudinal compressive forces strikeing the dorsum of the metacarpal head causing simultaneous flexion and longitudinal compression. Metacarpal bases are solidly fixed onto the distal carpus with stout volar, dorsal and intermetacarpal ligament attachments. Small finger and ring finger articule on the hamate's two concavities with signifcantly more mobility than the middle and index fingers. Generally caused by high energy direct trauma/blow to the metacarpal head with the wrist flexed. Also can result from direct force to the palm, such as the handle bars in a motorcylce accident. Complete neurovascular exam indicated as digitial ischemia and neuropraxia have been reported. P/A, lateral and oblique views of the hand. 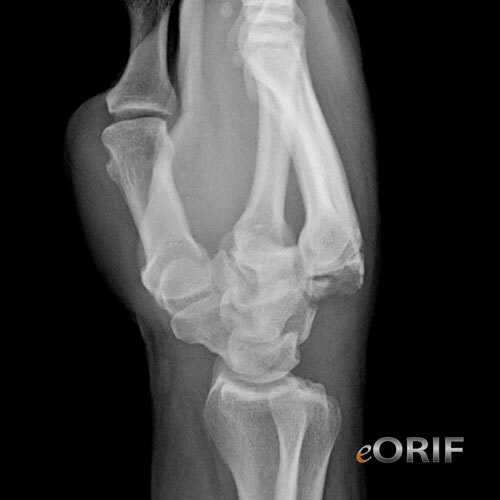 Dorsal fracture-dislocations can be missed on standard views. Best seen on 30° pronated lateral view. CT: indicated if suspected CMC dislocation is not evident on plain films. 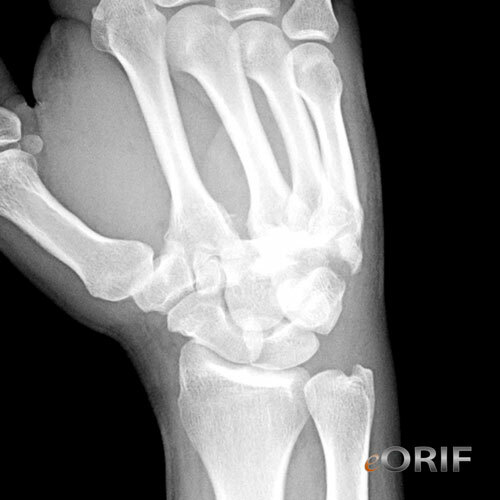 Reverse Bennett's fracture (5th CMC fracture dislocation): Open reduction via a small dorsal lazy-S incision, Avoid damage to the dorsal sensory branches of the ulnar nerve. Reduced and fix with a longitudinal Kirschner wire. Isolated Dorsal or multiple dorsal CMC dislocation: CRPP. Traction in flexion with simultaneous longitudinal pressure on the dorsally displaced metacarpal base, followed by extension of the metacarpal head when length has been restored followed by longitudinal and/or oblique K-wire fixation. Post-op: Volar plaster splint. is continued for 4 to 6 weeks, at which time the wire is removed. IP and MP joint ROM exercises. 7-10 Days: Wound check, repeat xrays to ensure maintenance of reduction. Continue volar splinting. IP and MP joint ROM exercises. 4-6 Weeks: Remove K-wires. Progress with ROM. 3 Months: Evaluate ROM. Consider OT if motion is poor. Sport specific rehab. 6 Months: Return to sport / unlimited activity. 1Yr: Follow up xrays, outcome assessment.